Legendary Lynn creates her own unique styles of stilt walking entertainments. 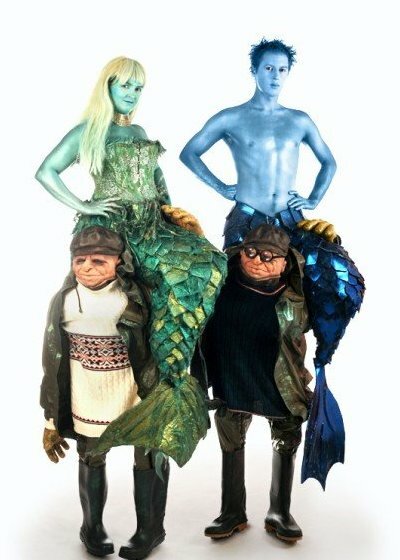 With such amazing costumes as the Merpeople - a mermaid and a merman being carried on the shoulders of two short-sighted sailors. A 25 minute Street Show on Stilts featuring the character Carmen Miranda as she sings some of her old Hollywood favourites, accompanied by her all singing, all dancing, maraca playing palm trees ! The show begins with a promenade performance while the palm trees search seek out the perfect location for their famous Hollywood Star to perform. Pushing trolleys full of suitcases, vanity cases and an assortment of hat boxes, the palm trees set the scene while Carmen 'meets her public'. A total Hollywood experience follows with songs, dancing, helium balloons and cocktail cabinets.